Fencemakers’ alternative to wood fencing, Smartwood Fencing, offers all the characteristics of wooden pickets and slats without the need for maintenance. No rot, no rust, no warping and no repainting required. Our latest innovation is guaranteed to turn heads and make your property more appealing. Our Smartwood fences are made with 65 x 16 aluminium sections, specially coated in a choice of timber finishes to compliment the exterior of any home. The Smartwood slats can be installed either horizontally to suit the modern architectural look, or vertically to reflect the appearance of a picket fence. 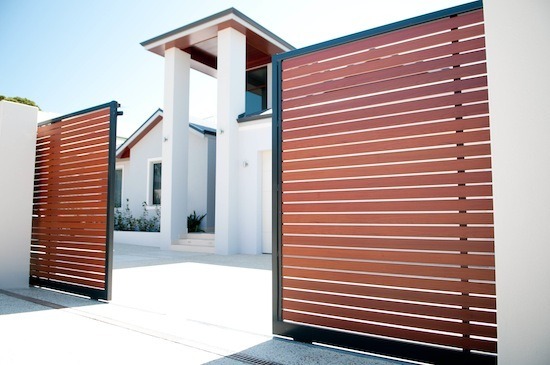 All of our Smartwood Fencing can be paired with custom Smartwood gates to fully secure the perimeter of your home. Each local council has strict guidelines regarding the allowable gap between slats on Smartwood Fencing at the front of your property. 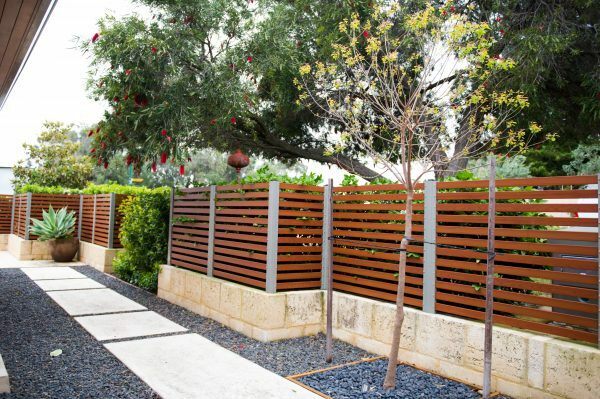 We will adhere to these guidelines and we can help you navigate through your legislative responsibilities for installing slat fencing at the front of your property. Smartwood Fencing not only secures your property and adds value to your home, but it provides endless benefits for your home or business with its distinctive look and versatility. Smartwood Fencing gives your premises the timeless, classic and chic look of a wooden fence, which adds substantial value to your property and gives you the ease of caring for an aluminium fence. Our Smartwood fences are ideal for clients who require a durable, secure and maintenance-free barrier for their premises. The special and patented timber coating finish is so durable that there is no maintenance or coating required. It also doesn’t involve any necessary revarnishing. This is ideal for those who have always wanted timber fencing but who live in seaside locations, making it a hostile environment for wooden slats. Our Smartwood fences are different to other wood-look aluminium slats on the market. 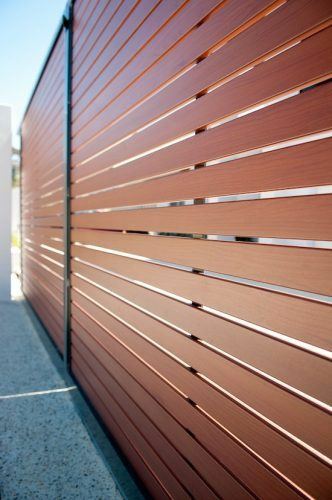 The wood-look on our Smartwood slats is a textured wood grain powder-coated finish. This is opposed to a vinyl wrap, wood-look finish that many competitors use. The problem with the vinyl wrap used by competitors is they don’t tend to age well, as the sun often breaks down the glue used to fix the vinyl to the aluminium slat. Our power-coat finish, however, is applied following a five- stage pre-retreatment process of acid wash baths, which guarantees that the surface of the fence or gate is very clean. 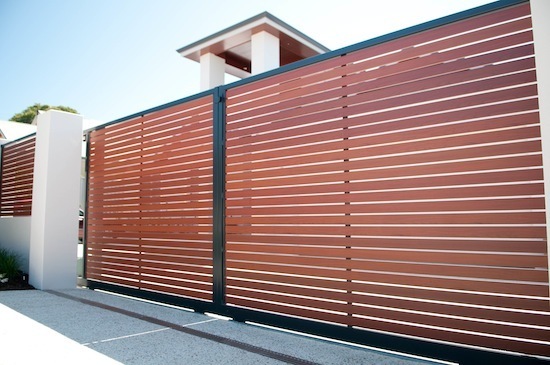 This guarantees the bond between the powder-coat and the fence or gate is the best it can possibly be. We can offer a 15-year workmanship guarantee on our products, because we know our powder-coating lasts. Take a look at our gallery below and be inspired by our range of wooden fencing options from Fencemakers. Are Timber Fences and Picket Fences Worth The Effort?